With a recent push for development of denser neighborhoods with more bikes/pedestrians and less cars, isn’t it time to get serious about long-term infrastructure changes to the Central Square subway station and what is essentially an open air bus station spread throughout C2? If you have ever taken a bus in or out of C2 on a regular basis, especially in winter, you know it can be a very unpleasant experience. Most of us have experienced waiting for a bus that never comes (or comes so late you have already opted for a taxi, that is, if you can find and afford one), waiting in overcrowded shelters (if you’re lucky enough to have a shelter at your stop), navigating over snowbanks, and then showing up to work looking like you have just completed the Iditarod! If you are unfortunate enough to wait in the “Bus Triangle” next to Carl Barron Plaza, you’ve got a headache before you even show up at work! This area has got to be one of the most inhospitable places in the Square. The noise level prevents casual conversation (forget about phone conversations), bus fumes counteract any pick-me-up you may have gotten from your morning coffee, not to mention all the trash and debris that collects in the area. This is all before your bus struggles to get over two lanes to make it into the intersection to cross over to Prospect. If the C2 Red Line station was little used or if C2 had fewer bus patrons, then the current state of affairs would be somewhat acceptable, but that is NOT the case. The Central Square Red Line Station ranks as #7 for most entries for all subway lines, Ch.2 pg. 4 . The other stations ranked in order of most entries are South St., Downtown Crossing, Harvard, Park St., Back Bay and North Station. All of which have either massive underground infrastructure and/or dedicated bus stations, or underground bus stations like Harvard. Daily bus entries for weekday ridership in C2 tops 6,200 passengers, that does not include alightings (passengers getting off busses). C2 is a major transit hub and should be treated as one. It’s time for the City to think about what changes are needed in order to take C2 into the next 50 or more years. 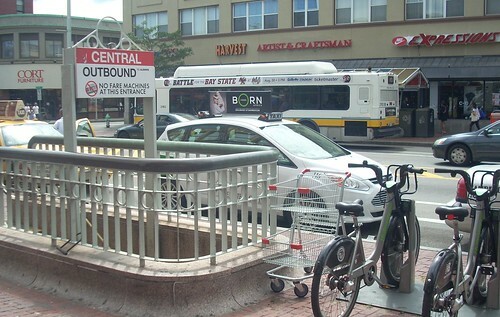 In order to address some of these issues, both in the long-term and short-term, the Transit Advisory Committee held a meeting on Aug. 13 at the Senior Center in Central Square. The goal of the meeting was to collate different ideas from the community concerning bus circulation and locations of bus stops in Central Square (C2), and in general, improving the experience of bus passengers. The City has also hired CDM Smith and IBI Group to conduct a study of the current bus operations and recommend short and long-term improvements. A budget of $50,000 has been set aside for the study. Several issues were discussed: Connectivity vs. congestion, trash and debris caused by what is essentially an open air bus/subway station spread throughout Central Square, confusing signage or lack thereof, outdated bus shelters, installing real-time digitized schedules, and less than optimal locations for bus stops and layovers. 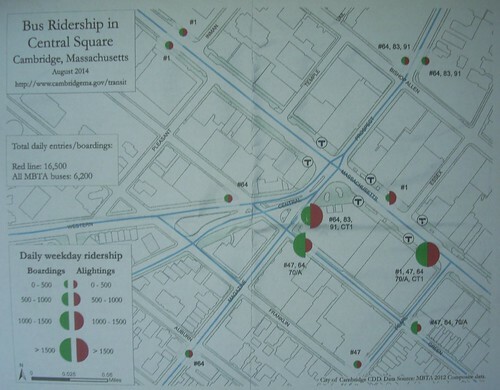 Short-term improvements are a relatively easy fix: better signage/maps at bus stops and in the subway station for those patrons transferring to busses, relocation of bus stops to areas outside the most congested parts of Mass. Ave. (between Prospect and Brookline St.), cleaner/updated bus shelters, and relocating bus layovers to Magazine St. However, these alterations are only going to be minor improvements over what currently exists, and quite frankly, should have been done yesterday. They also distract from discussing bigger plans for changes that would take C2 public transit into the future. It’s time for the City to discuss plans for an underground transit infrastructure and to create a centralized bus station that provides a clean, connected, efficient, sheltered and organized station for the thousands of people who use, and will use, the MBTA buses and subway. Such a plan would also free up parts of Mass Ave. and surrounding streets for better and safer bike lanes and a much improved pedestrian experience in the Square.